Posts about college athletics appear separately on this site in the Ongoing Debate section under NCAA Sports. David Simon is funny and blunt. He announced at this packed immigration rally that he and I have failed so far to get a “green light” for our miniseries based on my MLK-era books. But we haven’t given up, either. A freedom story from the guts of racial struggle remains urgent and timeless. Below is the written text for my speech. They gave me only five minutes to cover the historic highs and lows of U.S. immigration history, but I was honored to try. Other speakers offered a wide variety of perspectives both personal and profound. They are listed at the bottom along with a link to the Washington Post live stream video of the rally. There is also a link for contributions to the four groups working for immigrant rights. I have been laying low on social media in recent months, working on a book, but I hope to take a more active part in national dialogue again soon. Thanks to Beth Am, the organizers, and all of you for coming. The issue that brings us here has deep roots in American history. Our founding heritage is compromised by embarrassment and disgrace regarding immigrants, but also, as with slavery, it contains profound inspiration with tools for freedom. I submit two tasks tonight. First we must ground ourselves in democratic principle. Second, we must recognize that those principles require personal engagement across the inhibiting lines that divide our nation and the world. In 1790, America’s first naturalization law required an aspiring immigrant to be “a free white person.” For nearly two centuries afterward, our leading intellectuals helped nativists secure the “white person” standard within a pseudo-scientific hierarchy of races, always with white people on top. In the late 19th Century, Hopkins professor Robert Bean weighed brains, seeking to prove that white ones were heavier and therefore smarter. John Fiske at Harvard analyzed the wrinkles in brain lobes, and phrenologists measured the angles of foreheads and jawbones. Anthropologists catalogued up to 34 distinct shades of skin color. The founders of sociology, psychology, and many other social sciences joined naturalists to make eugenics a centerpiece of progressive movements to improve mankind by making foreigners more like themselves. In 1907, Congress raised the stakes of whiteness by mandating that any American woman who married a non-white immigrant would be stripped of her own citizenship without trial. Such exclusions persisted in spite of contradiction and embarrassment. Definitions floundered over basic categories, let alone details. Eminent social scientists counted variously three, five, eleven, sixteen, on up to sixty-three distinct races. Nevertheless, race-based immigration quotas persisted until well after World War II. Here I can speak personally. My sister Cherry is a Korean War orphan who has lived her whole life without knowing any Asian peers or peer families. She was abandoned among other starving infants in 1954, when there were no immigration slots for Asians, and a lawyer advised my parents that authorities in Georgia never would approve refugee status for a non-white baby from an orphanage near the border of communist North Korea. The lawyer confided outside the law, however, that those same cowardly authorities probably would not seize and deport an actual baby who arrived without papers. So my father flew to Korea on slow airplanes with propellers. Sure enough, desperate nurses at the orphanage agreed to release Cherry but only if my father agreed also to take—meaning technically kidnap—a second malnourished baby to an adopting family in California. This is a blessed, hopeful story for our family. Cherry usually hosts the sibling reunions, but she grew up with no exposure to Asian people or culture. That’s really a gross understatement. We didn’t even have Italians in Atlanta. I think the first pizza restaurant opened when I was in high school. We lived among homogeneous white Protestants segregated from black people. From my own work in civil right history, I urge you to recognize that the black-led freedom movement of the 1960s provided sacrificial leadership and political genius to open our immigration laws to the world. A largely invisible people, who lacked every political advantage from wealth and social status to the vote, displayed stupefying courage. Small children, mostly girls as young as six years old, broke the emotional resistance of segregated America by singing freedom songs as they marched into police dogs and firehoses in Birmingham. How’s that for conquering your fears and inhibitions to make witness for a larger cause? Since then, applicants from all countries have met neutral standards passing through U.S. immigration. Whole communities flourish that never before existed, even here in immigrant-rich Baltimore, pledging together to uphold our Constitution-based nationhood above every ethnic prejudice. Over the past fifty years, our openness to newcomers has transformed the face of the United States literally and figuratively. More than we realize, Americans are at home with our democratic creed of multi-national, multi-ethnic citizenship. Universities that once admitted only white males now spearhead diversity with students and teachers, doctors and patients, administrators and workers, from many nations. If you find it hard to imagine such noble sentiments from a drawling old Texan fifty years ago, let’s join together to achieve and defend something nobler. I think Lyndon would be happy. My portion begins at about 1 hour and 27 minutes in. 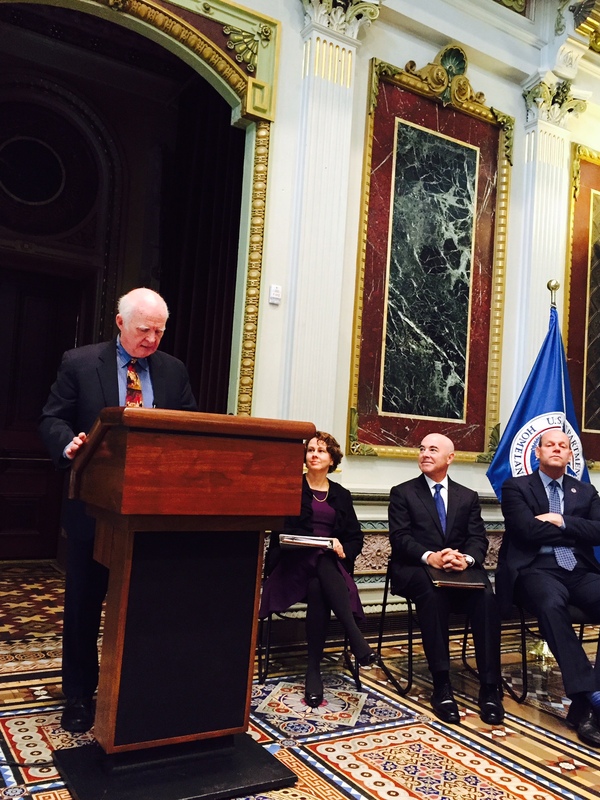 At the podium with (l-r) Cecilia Munoz, Director, White House Domestic Policy Council; Alejandro Mayorkas, Deputy Secretary, Department of Homeland Security; and Leon Rodriguez, Director, US Citizenship and Immigration Services. Congratulations and welcome, fellow citizens! 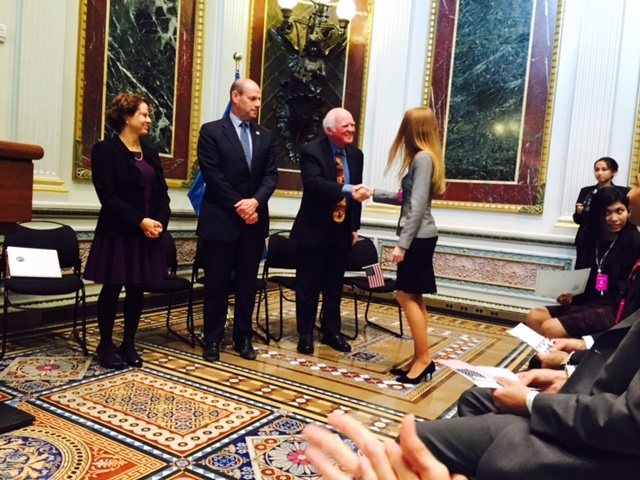 Let me thank Cecilia Munoz from the White House Domestic Council, Alejandro Mayorkas from Homeland Security, and Leon Rodriguez from USCIS among the gracious officials who have allowed me to share another thrilling ceremony like this, when people born around the globe formally join our Constitutional compact to uphold freedom in self-government. So immigration blessed us with Cherry in spite of the old immigration policy, long before I knew anything about the 50-year-old Reform Act we celebrate today. Many Americans still know very little about that historic law. You may be familiar with the origins from your application process, but I have been asked to review for you its central place in our Constitutional history. The Immigration and Nationality Act of 1965 grew directly from momentum built by the modern civil rights movement, in the era of Dr. Martin Luther King. Having been enthralled to study and write about that history for nearly 40 years, I can assure you the 1965 law was difficult to pass. Some called it a miracle. Anti-civil-rights forces filibustered to preserve restrictions that had choked down immigration from all but a few countries in northern Europe, excluding most of the world. Senator Edward Kennedy said political success was unimaginable until 1964, when civil rights cracked open the gate. Even so, President Lyndon Johnson had to cajol, wheedle, and cuss. “Where’s my blankety-blank immigration bill?” he yelled day and night. As full-fledged citizens, you may be entitled now to hear his actual profane words, but not from me here in this dignified space. These are ringing words of freedom. They affirm that the United States is founded not on any language or ethnic identity, but on the pioneer ideal of equal citizenship embodied in the Constitution’s first three words: “We the People.” A few historians like me have proclaimed the 1965 Act a third pillar of democratic fulfillment from the civil rights era, along with Voting Rights and the Civil Rights Act of 1964. You are a testament to that ideal. No other nation holds naturalization ceremonies quite like this one. And yet, the law that brings you here lacks public appreciation for its impact and promise. There is no Martin Luther King of immigration reform—nor any landmark anniversary on par with Selma and the March on Washington. Our immigration stance, which embraces applicants worldwide, earns nothing like the stature it deserves here in the United States. Critics still ignore or belittle the 1965 law, branding it merely a Cold War measure to admit more refugees from Communism. There remains an underside to American performance for immigrants, legal and otherwise. Even on this happy day—perhaps especially on this happy day—we should pause briefly to fortify hope by acknowledging reality. I would be shocked if most of you do not suffer moments of isolation, doubt, and rejection, not only from Americans by birth but from members of other immigrant groups. The United States has not reached its perfect Union. We must seek to understand flaws from the past in order to overcome them for the future. The very first naturalization law, which established in 1790 the oath and other features of today’s ceremony, required an aspiring immigrant to be “a free white person.” For more than a century, as our upstart nation grew slowly into a world power, nativists labored to place the “white person” standard within some scientific hierarchy of races, always with white people on top. This ruling conceit culminated in signal embarrassments for three consecutive years. From this day forward, I urge you to proceed as though you own an equal share of our nation’s faults as well as her glories, because you do. Our votes count the same. We are pledged to make real that equal responsibility from the founders, and your experience is vital. Be pushy if need be. Help us lay claim to the converging path of justice that you have marched in good faith, drawing strength from inclusion—rising from discrimination toward full respect and opportunity alongside still-disfavored groups such as women, the disabled, persons of color, and gay and lesbian communities, among others. American citizenship is a tough job. Here’s hoping no one told you it’s easy. Welcome again. I am honored to join you. God bless. 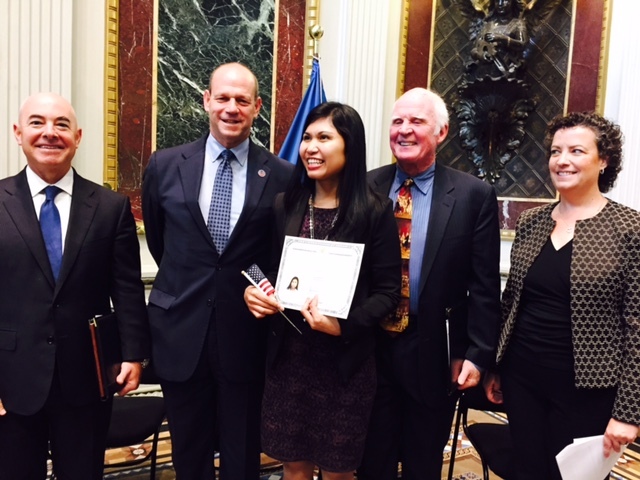 After today’s ceremony with newly naturalized US citizen Gina Haller (center, with official certificate). A new citizen comes forward for her US citizenship certificate during today’s ceremony. Elephant in the Room: Is Partisan Gridlock Driven By Coded Silence About Race? First, the pleasant news. 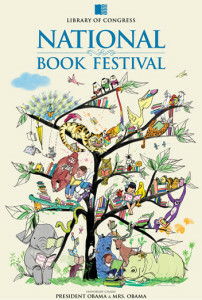 Christy and I were invited to attend the 13th annual National Book Festival in Washington. It was my second appearance there as one of the 100 or so featured authors for the year. The reception on Friday night September 20 took place in the main Jefferson Building at the Library of Congress, with its stunning vaulted ceilings of classical mosaics. That entrance hall is one of the most beautiful public spaces in the world. It lifts the spirit. I wish every child could spend time there on a school visit to the patriotic sites of Washington. We visited a number of friends at the reception, including our former Baltimore Orioles compatriot Jonathan Yardley, who is now a transplanted Washington Nats fan, and his wife Marie Arana, author of an acclaimed new biography of Simon Bolivar. I got a novel about John Brown signed by author James McBride, but I missed Linda Ronstadt, whose book “Simple Dreams” sold out quickly, spurred by poignant news that Parkinson’s Disease has ended her singing career. Rumors circulated that the National Park Service will banish the Book Festival from the National Mall beginning in 2014, for security reasons or merely to spare the grass. Future festivals would be moved indoors to the Washington Convention Center. If so readers will suffer a loss, because the outdoor event draws crowds up to 100,000 people circulating among open tents marked by pennant flags for book categories from fiction to poetry. My hour’s presentation in the History and Biography tent was fairly raucous by literary standards. I argued that our contemporary political discourse is sadly out of balance with the legacy of freedom from “The King Years” 50 years ago. Fearful hostility erodes pubic trust, and liberals are partly to blame. Not even President Obama can discuss the influence of racial politics. The audience jumped in with lively questions and comments. Here’s the C-SPAN video: http://www.c-spanvideo.org/program/KingYea. Aspen Ideas: College Sports at a Crossroads: Entertainment or Education? I took part in a panel discussion entitled “College Sports at a Crossroads: Entertainment or Education?” at the Aspen Ideas festival. Below is a short clip of Joe Nocera (New York Times columnist) and Craig Robinson (Oregon State head basketball coach). The 1 hour, 10 minute video is available with a FORA.tv subscription. Are Big-Money College Sports Healthy? Or a Bubble Ready to Burst within Higher Education Itself? I leave today for public discussions this week on sports and education. These issues have exploded for me as a sideline since my capsule history of NCAA sports appeared last fall in the October issue of The Atlantic. Tomorrow morning, in Dallas, I will appear at the national convention for all the college athletic directors in the United States. Here, on page 41 of a voluminous 58-page agenda, the panel features three respected sports leaders. My role will be to explain and advocate the 3-point reform agenda I first presented in a blog this month. I am nervous in anticipation of controversy, as I will warn that the crucial reforms of transparency and balance are doomed until colleges recognize basic rights for their athletes. Moreover, I plan to argue that the vast majority of schools have blindfolded themselves unnecessarily, and corrupted their core educational mission, by tolerating national rules that impose “amateurism” on athletes to enrich only a hundred or so of the 1,200 NCAA schools among the nation’s 4,000+ colleges overall. The next day, Thursday June 28, at the Aspen Ideas Festival, I join what should be a fiery panel, entitled, “College Sports at a Crossroads: Entertainment or Education?” Vice President Wallace Renfro will represent the NCAA. New York Times columnist Joe Nocera and I will renew our urgent criticism. Our fellow panelist Craig Robinson, the head coach for men’s basketball at Oregon State University, is better known nationally as the older brother of First Lady Michelle Obama. This conversation could go in a hundred directions. Most of them will be new to audiences, and we hope to find some clarity. On Friday, from 5:30 to 6:30pm at Aspen’s Hotel Jerome, I will be in one-on-one public conversations with actress Anna Deavere Smith about sports as the window to possibly a larger crisis in higher education. Anna is a treasure of innovation for American theater and film. She is best known for her own one-woman plays in which she inhabits a panoply of real-life characters. I met Anna about twenty years ago, when she was playing Anthea Burton in the Tom Hanks-Jonathan Demme film about AIDS, Philadelphia. She is from Baltimore, where I have lived the past 26 years. Beyond her stage talent, I admire Anna for her creative spirit of free inquiry into crucial dramas and issues in American life. She sees college sports in the larger framework of an impending crisis for higher education. I think she’s right. We’ll see how the illustrious and assertive Aspen audience responds. Hidden away, largely out of public view, the vast majority of U.S. colleges still do emphasize classroom teaching within a student-centered governance and curriculum. These are the nation’s fast-growing community or “junior” colleges. Last week in Denver, I spoke to 400 students from their Phi Theta Kappa honors society. They were an inspirational group.